Do you know who made your clothes – and how? Mainstream fashion has never been more accessible and affordable. But cheapness, and fast production season after season comes at a huge human and environmental cost. Fashion is the second largest worldwide polluter with a bigger carbon footprint than global shipping and aviation combined. And while we are shopping for clothing 400% more than 20 years ago, every second the equivalent of one garbage truck of clothing is burnt or sent to landfill. How can we still love fashion with an awareness of fashion’s impact on the environment? Find out how with sustainable fashion expert, stylist and activist Alice Wilby! With a real, honest look at the impact of the fast fashion industry on climate change and human rights, learn about how you can change your wardrobe and mindset to sustain your own style. Discover the makers and designers who through sustainable materials and working conditions are designing for the future – right now! Alice Wilby is a sustainable fashion stylist and co-founder of art direction agency A Novel Approach. She has been working with sustainable brands since 2009, previously editing Eco-Age and styling photographic campaigns for Fashion Revolution. Most recently Alice has appeared on the BBC as a sustainable fashion expert and also teaches short courses in sustainable fashion at Central St Martins. 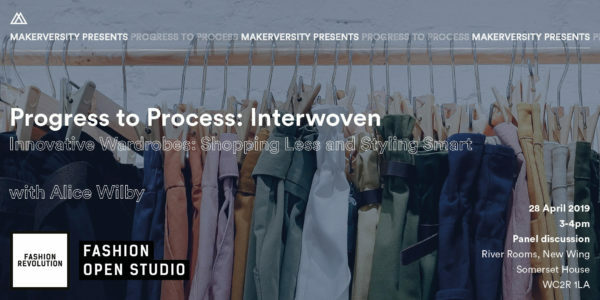 This event is part of Progress to Process: Interwoven, a weekend festival which explores how textile innovation intersects with design and activism to create sustainable change within the fashion industry and beyond. Interwoven is part of Somerset House’s 2019 Earth Day season.